The environment under your home is just as important as the environment inside your home. Excessive moisture conditions in a homes crawl space can lead to a number of expensive and troublesome problems such as: wood rot, mildew, foundation problems, sticking doors, damaged flooring and musty odors. It is important that the crawl space of a home be inspected on a regular basis to identify moisture problems. At Harris Pest Control, Inc. we have been inspecting home crawl spaces since 1973. We identify any excessive moisture conditions and then develop and implement strategies to correct them. Wood Decay: Wood will decay when it is wet. Condensation from soil evaporation or humid air entering the crawl space is a common source. Condensation: Warm, humid air contacts the cool surfaces of a homes insulation, air ducts, walls and sub structure. Condensation causes insulation to get heavy and fall from floors and ducts. Standing Water: Water enters a crawl space as a result of a seepage, soil saturation, high water tables, and grading issues leading to high humidity and damage. 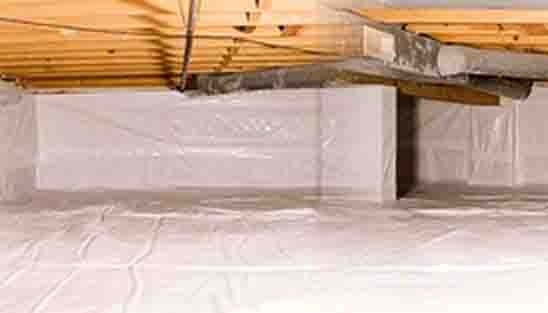 Moisture Barrier: A soil cover reduces the amount of moisture added to a crawl space. Up to 12 gallons of water a day can evaporate into a 1,000 square foot crawl space. Crawl Space Encapsulation: A sealed crawl space prevents wet air from entering through foundation vents, holes and soil. A dehumidifier is installed to condition and maintain the crawl space air. Crawl Space Drainage System: Removal of crawl space water can be handled with a well designed drainage and pump system. Contact Us today for more information or to request a Free Evaluation of your business.